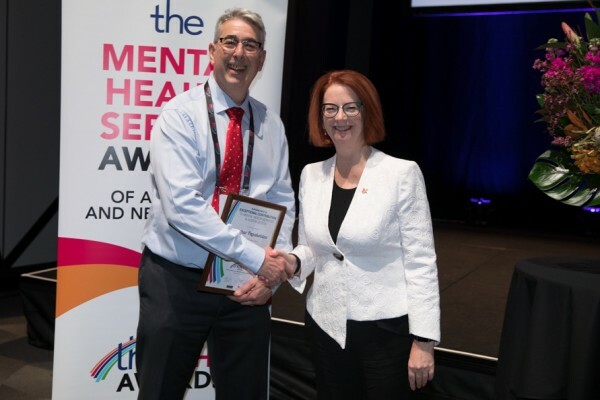 At the annual TheMHS conference in Adelaide, Neami CEO Arthur Papakotsias was awarded the prestigious TheMHS Award for Exceptional Contribution to Mental Health Service in Australia or New Zealand. The TheMHS Awards aim to promote the delivery of good mental health services, encourage consumer-focused services, recognise good practice, and reward dedication and commitment to service delivery. Arthur was recognised for his "career-long steadfast commitment to a guiding vision of culture change in mental health service delivery, sustained by a constant belief in the right to full citizenship and quality service provision." Arthur trained as a psychiatric nurse in the mid-1980s when mental health care was still institutionally based. He held a vision that people with mental illness could live meaningful and contributing lives in the community and has pursued this vision throughout his career, leading attitudinal change in the sector and the broader community. He has championed the capacity of the NGO sector to provide psychosocial and recovery-focused mental health support that is complementary to clinical services. His commitment to quality service provision, evidence-based approaches, and outcomes measurement has contributed to an awareness amongst consumers, families, governments, funders, and mental health providers that psychosocial and recovery-focused supports can have a valuable impact on improving people's lives, and can change community attitudes about mental illness. Arthur was presented with his Award by Former Prime Minister and Chair of Beyondblue, The Hon. Julia Gillard AC. You can read more about the Awards and this year's winners on the TheMHS website. Congratulations Arthur on a well-deserved recognition!